There are countless learning management systems available globally. The task of selecting one can seem like an overwhelming challenge at first. Ultimately, you should aim to find an LMS that helps you efficiently deliver corporate learning and enables you to scale your training efforts, while ensuring you have the support you need to achieve your learning goals. With so many options to consider, where do you start? At LearnUpon, our team has the valuable experience of having overseen thousands of LMS implementations. We’ve seen what works for businesses just like yours, and we’re going to walk you through the key considerations that are easily overlooked when evaluating LMS options. 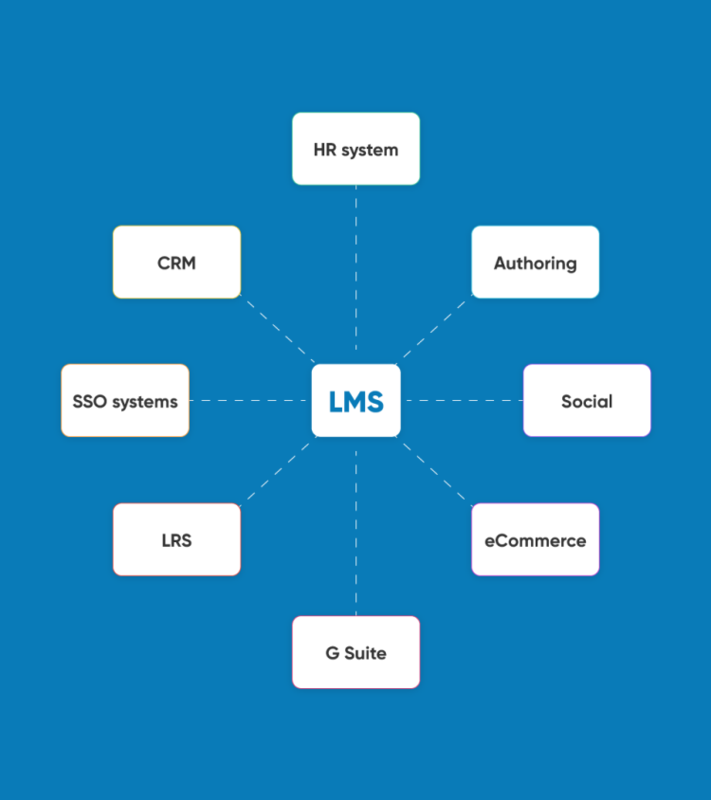 Many LMS vendors focus on promoting their features. However, it’s pointless to choose an LMS system loaded with features that you simply don’t need and won’t use. These features may be a waste of money, depending on the pricing model of your LMS. Unwanted features also negatively impact user experience. Not only are overly complicated systems difficult to use, they also confuse learners and distract them from key learning goals. The more complex the functionality, the longer it takes to educate your learners on the platform too. Unwanted features can force you to invest in additional training that minimizes your learner’s discomfort, costing you valuable time and resources. On the surface, a multitude of features may seem attractive, but in the end, an LMS jam-packed with features you don’t need may only serve to waste money and confuse your learners. LMS integrations are important. 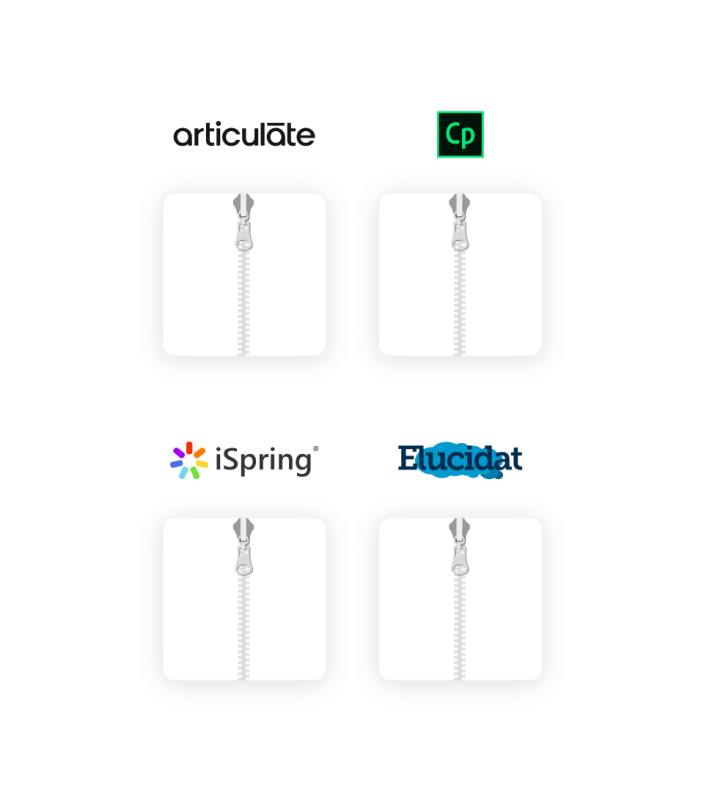 By connecting your most used applications, or the ones you intend to use, you get the most value and efficiency out of your LMS. Also, working with systems your users already know increases their engagement and allows you to customize your LMS to suit their needs. For example, a common workflow for LearnUpon admins is to use our API for everything from integrating with third-party apps to generating gamified leaderboards. Single sign-on (SSO) is another essential integration. It allows your learners to sign-in to your LMS with the same set of credentials used for other platforms and applications, making training effortless to access. The type of customer support offered by an LMS vendor should play a big part in your decision-making. If an issue arises with your LMS, you need to have confidence that someone will always be there to help. Basic information about hours and channels of communication will give you a sense of how much the vendor has invested in the service. You can also assess their customer support reputation by checking existing customers’ experiences of different LMS vendors through online reviews. What hours does the support team work? Do they provide email support, telephone support, or both? What’s the average response time? Do they resolve my queries/issues? It’s important that the support offered by your vendor extends to content. For example, if you use an authoring tool with your LMS, your vendor should understand the tool and its outputs. At LearnUpon, most of the support queries we receive are content-related. Integrating content into your LMS can result in any number of issues, like unsuccessful communication of completion statuses back to the LMS. If your vendor doesn’t offer support to cover these kind of issues, you may struggle with courses that won’t track. Make sure your selected LMS vendor has the expertise and resources required to keep your course content running and reporting smoothly. Does your vendor have a deep understanding of content standards such as SCORM, xAPI, etc? Do they understand the main authoring tools, like Articulate Storyline and Adobe Captivate? There are lots of different pricing models on offer in the LMS industry, making comparing quotes from multiple vendors a little confusing. Commonly, we see pricing based on charging by usage volumes, or the number of active or registered users required. Depending on your usage needs, different pricing models return very different costs. We suggest you start by mapping out your company’s projected usage and align this with what your shortlisted vendors offer. 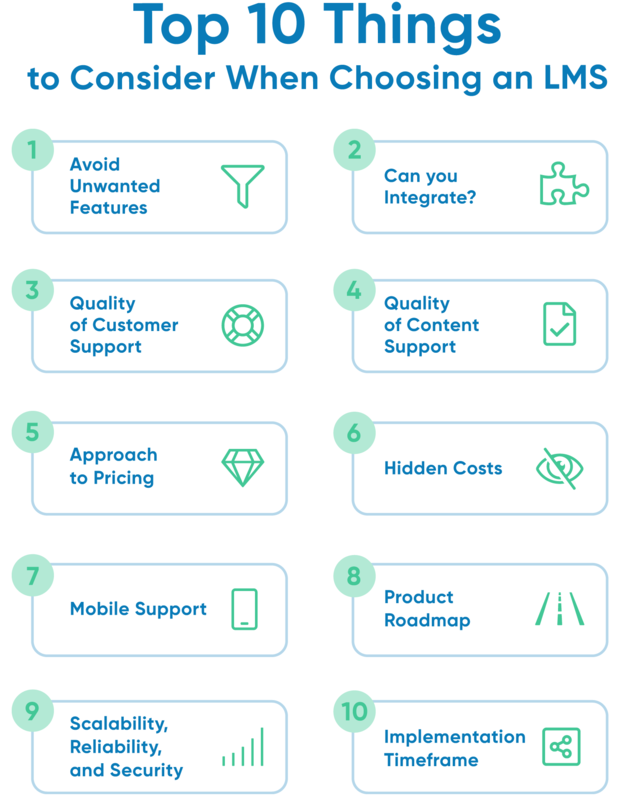 Once you understand the pricing model, don’t forget to ask for a list of all additional costs. You don’t want to get caught out! For example, if the pricing model you prefer is based on user or usage limits, ask what happens if you exceed these limits. Are there any content or course upload limits? What length of contract is available? Monthly, annual, bi-annual, etc.? Costs that are not obvious from the outset can radically impact the cost of investing in an LMS. Beyond the basic pricing model, there are any number of essential or optional services an LMS vendor may charge for. Set-up, installation, training, cancellation… the list goes on and they aren’t always advertised upfront. Keep this in mind when budgeting for your LMS. Ask all the necessary questions and read the small print to ensure you’re fully aware of all costs. While this isn’t an exhaustive list, considering these important factors will help you in the LMS selection process. We hope it provides you with a solid plan of action so you choose the best LMS for your business. The demand for mobile learning, or mLearning, has skyrocketed in recent years. We live in an age where consumers can do everything on their mobiles from ordering groceries, to turning on the heat. As a result, it’s not unreasonable that many learners will expect to be able to access their courses through their mobile as standard. That’s why it’s so important to ensure your LMS has this capability. In order to support learning outcomes, training should be easy for learners to access through their phone or tablet device. If user experience matters to you, you’ll need to research the range of mobile options your shortlisted LMS vendors offer. Check that they have worked through all the implications of mobile functionality. The eLearning landscape evolves rapidly. In addition to inquiring about existing features their LMS provides, it’s crucial to question vendors about their impending plans for development. The availability of an up-to-date roadmap will give you a sense of the resources the vendor has invested in continually improving and enhancing their product. Their roadmap should clearly illustrate how the LMS has been consistently updated to reflect changes in the industry. What did they release in the past 2 years? How is their roadmap decided? Can customers provide input, or suggest enhancements? As the LMS is improved, are there upgrade costs or downtime involved? Scalability, reliability and security are three of the most important factors to consider when investing in an LMS. These issues have the potential to impact the viability of your programs, and your organization’s reputation. By questioning your vendors approach to these areas, you will be better able to make a decision as to whether you trust them with your business and data. Will you have the ability to scale? Can you increase your active users if required? What is the average response time to requests submitted? What is the average downtime? Is there constant monitoring in place? Have there been any previous data breaches? Depending on the complexity of the integration and the efficiency of the vendor, implementation timeframes can vary drastically. We’re talking anything from a couple of hours right up to a couple of years! The probability of quick, straightforward launches is also dependant on the organization’s internal procedures. When comparing LMS vendors, it’s important to include questions about timelines to understand how prepared they are to help you meet your important learning milestones and deadlines. While this isn’t an exhaustive list, it covers the main considerations our experienced team have seen impact decision-making. By reflecting on the 10 points above and asking the suggested questions of your proposed vendors, you’ll be able to confidently make the right choice for your organization’s learning needs. Get in touch with LearnUpon to book your free trial and demo.